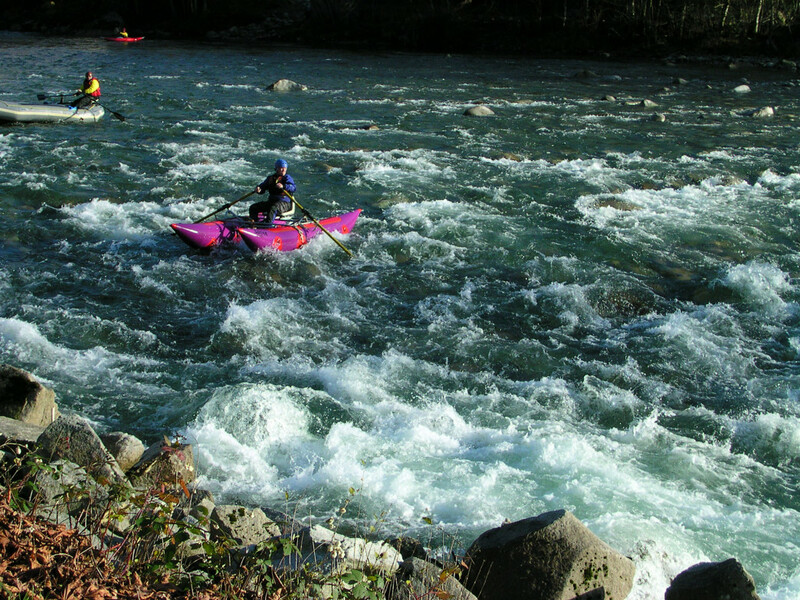 For whitewater paddling near Seattle, the Skykomish River is the place to go. Also known as “Sky River” or just “The Sky” (“Skykomish” itself comes from the Northern Lushootseed word that means “upriver people”), the entire river is 29 miles, with sections of everything from class I to class V rapids. 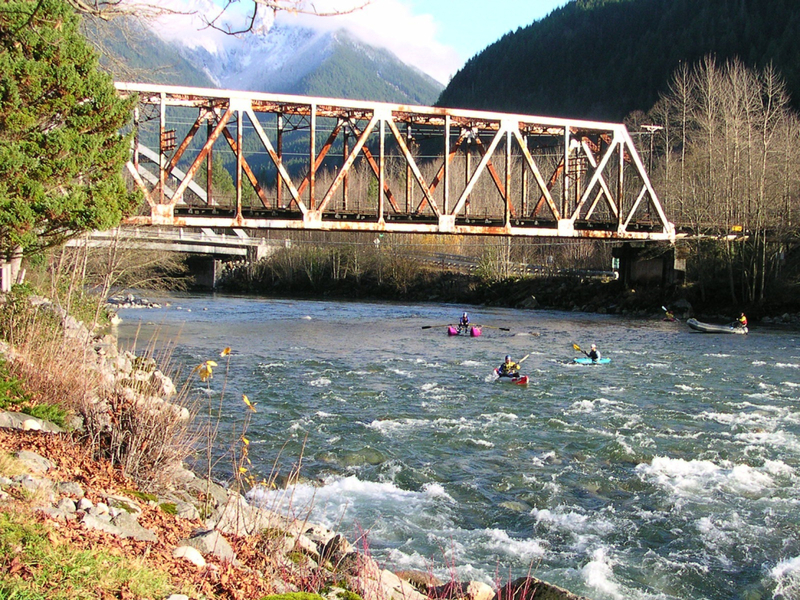 A great spot to get your feet wet with what the Skykomish has on offer is the 9-mile stretch from Big Eddy to Sultan, a class II rapid paddle with some beautiful scenery and wildlife. This segment begins a mile beyond the east edge of Gold Bar, under the Skykomish Bridge at US2. The Big Eddy put-in looks like a deep green, mildly swirling pool; you’ll be able to see it from the US 2 Bridge. Once in the water, most of the action comes in the first quarter mile: the class II segment is visible from the launch site. The rest of the run is made up of minor rapids, waves, and one chute, with plenty of gravel beaches for picnicking along the sides, and Mt. Index’s ever-looming presence. There are several guiding companies that can provide the logistics, gear, and expertise for you, such as Wildwater River Guides, Outdoor Adventures, and Alpine Adventures. If you want to get in some river time but paddling's not your thing, there are also ample fishing opportunities along the Skykomish River for Steelheads and Salmon. Steelhead (aka the fish of a thousand casts), are fun to catch through fly-fishing, though some folks prefer bait or jigs. The Reiter Ponds area is another good spot with nearby parking, but it can get busy, so go early in the morning to avoid crowds. Anyone looking for a good thrill within an hour’s drive from Seattle. To reach the take-out, drive east on US 2 to the west edge of Sultan, turn left (north) immediately before the bridge over the Sultan River. Along this 9-mile route, you'll float through old-growth areas of firs and hemlocks, and you'll have unforgettable views of the snowcapped mountains that surround. The put-in site for the Big Eddy to Sultan ride is just east of Gold Bar. 1.5 miles out of town, cross over the bridge, and pull into the big eddy fishing access gravel parking lot on the right. To get to Reiter Ponds from US 2 East, turn left on Reiter Road. Several miles after the US 2 intersection and past the gravel pits, turn right on the only paved road. Park your car at the Reiter Ponds Hatchery and hike down to the river. Reiters Ponds Hatchery and hike down to the river.